In Fire & Flood, Tella Holloway faced a dangerous trek through the jungle and across the desert, all to remain a Contender in the Brimstone Bleed for a chance at obtaining the Cure for her brother. She can't quit, she has to win the race, save Cody, and then fight to make sure the race stops before it can claim any more lives. In the next legs of the race, across the ocean and over mountains, Tella will face frostbite, sharks, avalanche, and twisted new rules in the race. But what if the danger is deeper than that? How do you know who to trust when everyone's keeping secrets? What do you do when the person you'd relied on most suddenly isn't there for support? How do you weigh one life against another? The race is coming to an end, and Tella is running out of time, resources, and strength. At the start of the race there were one hundred twenty two Contenders. As Tella and her remaining friends start the final part of the race, just forty-one are left, and only one can win. 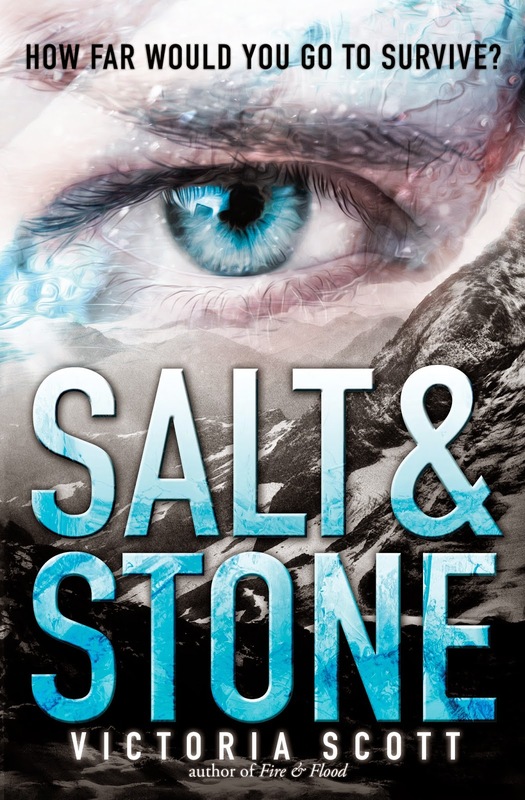 With the second installment of Victoria Scott's awesome Fire & Flood series only two weeks from release, I wanted to share and excerpt from Salt & Stone, and Victoria has also arranged a giveaway to celebrate.You could win a signed UK copy of Fire & Flood, a signed ARC of Salt & Stone, and signed swag. It's open internationally, but get in quick. Entries close within a week. I swallow and stare at him in the dark, my entire body itching to feel his touch. When I see the anticipation in his stance, the way he looks at me as if I’m both infuriating and appealing - it makes me feel powerful. But when he takes a step in my direction, that power plummets to some place untouchable. Now I’m a seventeen-year-old girl again, standing in the shadows with someone who feels like he’s lived three lives to my one. "Come with me," he orders. There’s no room for refusal, and I don’t want there to be. He takes my hand to help me step over sleeping bodies, both human and Pandora. When I stumble, he leans over and sweeps beneath my knees. I’m brought into his arms with the same ease I may use to curl a rabbit to my chest. But I’m not such an innocent, silent creature. I’ve got spirit and fire in spades. Though, right now, as he carries me to the single back bedroom, I have neither. I’m somebody else now. I'm Tella Holloway, Boston girl turned Montana transplant, sitting on the edge of her bed, awaiting her very first date with the boy who makes her parents uneasy. A boy who doesn’t speak nearly enough, but when he does, this girl stops and listens. In my mind’s eye, I’m wearing the silver-sequined dress that’s hibernated in my closet far too long. I feel beautiful and confident, and who cares if he said we’re going to the lake at night? I want to glimpse the look on his face when he sees me. I envision how his entire face will light up as if it’s lit from within. How his full lips will part slightly and his cold blue eyes will soften. Guy sets me on my feet, and I gaze up at him. Oh yes. Right there. That’s the look I imagined. OMG KELLY WHAT IS THIS NEW BEAUTIFUL BLOG DESIGN I'M SEEING????!!! *drools over keyboard* I AM SO ENVIOUS OF YOUR DESIGN TALENT ESPECIALLY AS I DON'T HAVE A SPECK. I would BUY a design of you if I had the chance Kelly, IF I had money of course. >.> Which I don't, but STILL. ANYWAY, I was supposed to be leaving a comment that didn't involve the above drooling so where was I?! OH YES THAT'S RIGHT I'M INCREDIBLY EXCITED FOR SALT AND STONE AS I LOVED FIRE AND FLOOD SO VERY MUCH. And I think that's it. Me too Ella and Zoe. I loved it! It was as if all my favourite dystopians were thrown into one, and I'm such a fan of Victoria Scott's snark and sarcasm she injects into her characters too. I haven't read the first book yet. What the heck is wrong with me?! It's awesome Joy. It has a bit of everything, a dystopian aspect, fantasy and a little science fiction thrown in there too. You definitely should Karin, I absolutely loved book one and can't wait for book two! Definitely going to enter for it! (Oh my days they sound so swoony). It's one of my favourite dystopian fantasy reads, simply brilliant! Good luck Faye. I was a big fan of her Collector series too, which reminds me, I need to read the finale of that one too. I loved Fire & Flood, brilliant dystopian! I was not a fan of the first book because Tessa irritated me a lot. Thanks for sharing the excerpt Kels, but I must admit I cringed a little because it was so romance/Guy focused. :/ Not sure whether I would continue the series...I do miss the pandoras though!! Some of the Pandora's were adorable weren't they! I actually liked Tessa, she was a little too much in places, but overall I loved her sarcasm and snark throughout. It's been one of my favourite dystopians. I hope you continue on with the series Joy. Okay, that excerpt. I really want to read this one now, the first book only touched a bit on the romance. The first book wasn't a favorite of mine because the heroine and I clashed but I do have hopes for the rest of the series. The first book was amazing, and that excerpt got me super excited for the second book!